Peter at Braemar here with a fishing report from the week ending June 26th. Like most areas across the Snowy Mountains, Braemar endured a very wild week weather wise with strong winds and heavy snow making conditions very unfriendly for those wanting to fish, however, there were a few hardy souls who braved the elements but results were hard to acheive. Sergy from Sydney fished powerbait and lures from in front of the Park during one of our many snow dumps on Friday and managed a maginficent mae rainbow around the 1kg mark on chunky cheese powerbait, Sergy certainly deserved his catch after experiencing first hand what the weather can throw at you here in winter, 2 angers from the Latrobe Valley alos ventured out into the elements and were rewarded with absolutely nothing, not even a bite, it hasn’t deterred Brock and Brett as they will be back in a few weeks time. The conditions at Braemar remain very slippery, part of the access track at the back of the Park has collapsed making access to the Lake virtually impossible, the track through the Park is still open but anyone coming to Braemar should call in at the shop or phone ahead for updates, boat launching is not available right now and vehicular access is restricted to the upper level launch area, proceed past that area at your own risk, no one is avalable to retrieve bogged vehicles. 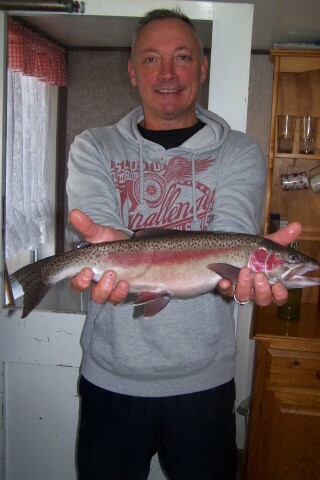 Pictured below is Sergy with his male Rainbow caught whilst it was snowing heavily at Braemar.